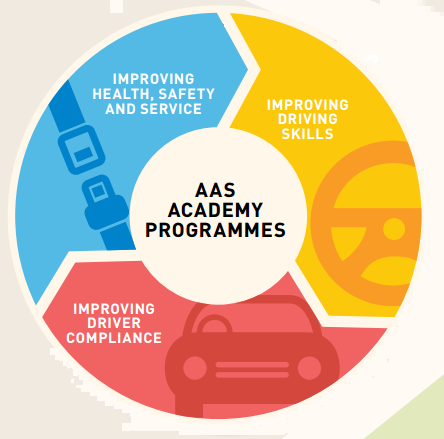 AAS Academy’s Workshops are highly focused bite-sized sessions on specific driver safety topics. All AAS Academy trainers are IRU/RoSPA trained and certified. Scheduled monthly classes are held at AA Singapore premises: 535 Kallang Bahru GB Point. Selected workshops are being carried out on a monthly basis. Check our schedule here . Maximum class size of 20 participants per workshop. All participants will receive a Certificate of Attendance on successful completion of the workshop. These workshops are highly focused in nature and its short duration makes it easy to be integrated as part of any employee/customer benefit programs. Employers can choose to deliver just one topic or have a combination of topics to form a short training session. This session covers practical advice to drivers and managers on how to ensure they act appropriately and within the law if they are involved in a road accident. Delegates are given case studies so they can reflect on how and why road traffic crashes occur and realise that most of them are avoidable. We cover the circumstances leading up to crashes and the effects on all parties post crash. This unit aims to develop knowledge, appreciation and skills related to attention and how it contributes to safe, responsible and incident free driving. Drivers will learn about how multi-tasking and taking your eyes off the road even for a second can be deadly for himself and other users of the road. Participants will also discuss about how we can tackle impaired attention and divided attention in its root. This session covers the handling characteristics of vehicles under acceleration, braking, cornering in relation to weight, height, position balance etc. In this session we also cover vehicle safety technologies such as ABS, Traction Control, ESP etc also, advanced or defensive positioning to maximise tyre grip and balance. In this workshop, participants learn about the risk multipliers of different adverse environmental conditions and how to mitigate these risks. Driver health and wellbeing are high on the agenda within this session, lifestyle, culture; working hours are all covered along with alcohol, illegal drugs and prescription drugs, nutrition and sleep. Delegates are coached on how to manage these risks to provide safer driving environments. This workshop aims to educate drivers on effective eco-driving skills and techniques. Participants will also learn how to harness the use of modern vehicle technologies to reduce greenhouse gas emissions, save on fuel cost without compromising on performance and thus improve overall safety and comfort. In this session, we explore the techniques of skilled, enjoyable and safe driving. Delegates are coached in the areas of positioning their vehicle(s) for safety and vision whilst maximising their progress on the road. Space management features highly, along with ensuring the correct gear is engaged to provided time, space and acceleration when required. Defensive driving, advanced driving and Eco-friendly driving are closely linked and delegates are coached in all areas under the heading of ‘Defensive Driving’’ . Managing space around a vehicle can help to avoid crashes or significantly reduce the risk of injury. This unit aims to develop knowledge, appreciation and skills related to speed, braking distance, following distance and stopping distance and how it contributes to safe, responsible and incident free driving. The speed awareness course helps drivers to understand why people drive above the speed limit, address the reasons for speeding and the potential consequences of speeding. Adjust your speed to the configuration and condition of the roadway; weather and visibility conditions; traffic conditions; vehicle and cargo conditions; and your own condition. In this session we cover the positive benefits of conducting regular vehicle safety checks prior to vehicle usage. Failing to perform regular vehicle safety checks will have a negative impact on running costs, staff downtime and in severe cases, life. Delegates are coached in this area and all of the critical safety issues are covered such as, Fuel, fluids, electrics, brakes, tyres etc.